Figure 1.8.2.1: The search bar at the top right of the screen. The dialog is opened by clicking the small gear icon by the search bar (Figure 1.8.2.2) in the top right of the screen and click enter. Figure 1.8.2.2: The advanced search dialog is opened by pressing the small gear icon by the quick search bar. Figure 1.8.2.3: Advanced search history includes all searches including quick search history. Figure 1.8.2.4: Search range is defined either by specifying exact base pair location using selection or entire sequence. Figure 1.8.2.5: Define number of allowed mismatches between sequence and results. Figure 1.8.2.6: Define which alphabet to use in search, DNA or Amino Acid. 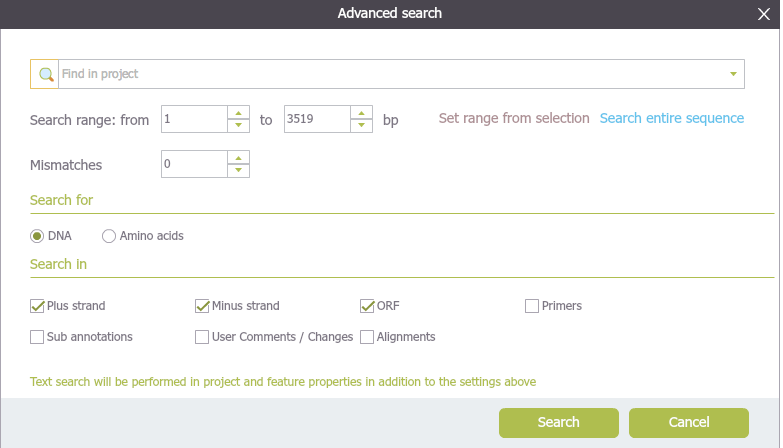 Figure 1.8.2.7: Select which fields to search in the project, strands, ORFs, primers, annotations, comments, changes and alignments. Results will appear in the search result tab, as in the quick search.